iOS firmware files should always arrive in IPSW file format so that they can be identified and used properly. Sometimes, users may download an IPSW firmware file for iPhone or iPad and it arrives as .zip file instead of .ipsw as expected, this usually happens on Windows computers but it can happen on a Mac too. The reason this usually happens is usually because of the web browser you used to download the IPSW firmware file which erroneously assigns it a ZIP archive extension. Fortunately this is extremely easy to fix and to change an IPSW marked as a .zip file into a IPSW .ipsw file. Why does this matter? This is necessary because iTunes will not recognize a firmware labeled as a .zip file as a proper .ipsw file, it must have the .ipsw file extension for it to be used by the iTunes software to be able to update iOS on an iPhone or iPad. Not to worry, it’s a piece of cake to change. To convert the .zip to .ipsw you must have show file extensions enabled in your operating system. For Mac: You can show file extension on a Mac as detailed here. For Windows: you can show file extensions by going to Start Menu > Control Panel > Folder Options > View > and turn off “Hide file extensions for known types”. That’s it, the .ipsw file will now be usable, you can learn how to use IPSW files here to update iOS on an iPhone or iPad, iTunes, and a Mac or PC. Once you’re IPSW file is properly labeled with a proper file extension you are free to use the IPSW file as usual with iTunes on a computer. To be clear, a .zip is a proper file format but for archives, whereas .ipsw is also a proper file format but it’s for iOS firmware files. IPSW files are not supposed to be .zip archives, when the operating system thinks an .ipsw is a .zip it is an erroneous file association based on a file extension. Thus, a .zip file is not an .ipsw file, and an ipsw file is not a zip file – you can not simply change a random .zip archive file extension to .ipsw and expect it to work and be recognized as a firmware, that’s not how it works. Remember to always download .ipsw files only from Apple servers, if you’re not sure hover over the IPSW link to verify that it has an apple.com domain, if the ipsw file link does not point to an Apple server do not download the .ipsw file. It’s also worth remembering that only signed IPSW files are usable, go here to learn how to check ipsw firmware signing status. Do you have any tips, tricks, or comments about properly using IPSW files and fixing an IPSW file that thinks its a ZIP file? Let us know in the comments! But, an .ipsw *is* a .zip archive, it’s not correct to say it isn’t. Yes, unless it’s named .ipsw instead if .zip it won’t load onto an iDevice, but it’s still a zip archive. An IPSW file is a firmware file for iOS hardware, it contains the iOS software for an iPhone or iPad. The .ipsw is the file format of the firmware, it’s not intended to be decompressed or extracted by anything except for iTunes to install onto an iOS device. If you see a file extension like .zip it’s because the extension was removed when it saved, this happens in Windows, Edge, and Internet Explorer often. It should always be .ipsw though. 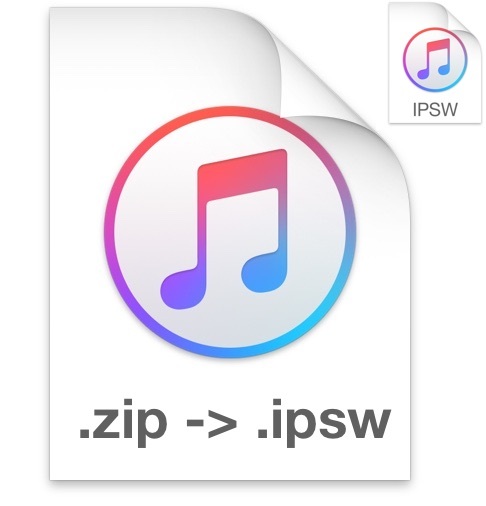 The IPSW file format name is basically short for “iPhone Software” aka “iPSW”, there is no meaningful purpose to try to extract it, it’s for iTunes. You won’t find any usable data inside. Great Job, you just saved me from wasting data for re-download.